The latest news from the NETT racing series. Address and Postcode for the track is Wooley Grange, Stanley Crook, Co. Durham. DL15 9AN. Marshals - If anyone can do one day please let us know asap. Brian Winrow Trophies - Please can anyone that won trophies last year, please bring them with you to the meeting this weekend. First rounds approaching fast. Online entries close Thursday at 3pm so if you wish to enter get online asap. After this for late entries contact 07756 948960 £10 charge. Marshals – we are still short of Marshals for both days. If anyone can volunteer for even one day, please can you let us know via Facebook, email or by text to Jo Best 07910 243788. If you want to race we need Marshals. Also, although we try our best to guess the number of children that may be racing, we cannot always guess correctly. To avoid the disappointment on a child's face, please enter asap. Any later and we cannot get the trophies engraved in time. A reminder - anyone who won a Brian Winrow trophy last year, please can you bring it with you to Wooley or if you are not coming arrange to have it sent back so that it can be given out at wooley next weekend. MARSHALS - we currently have 5 for Saturday and 6 for Sunday. We have put messages out to the local cadet forces in an effort to find more volunteers. We need 15 per day to meet requirements to allow riders to race in safety. If you can help please contact Jo Best on 07910 243788. Only four weeks to the racing season starts. Come on guys get your membership and entries done and let's make the first day of the racing season a smooth one. We will also be looking for volunteers for marshalling both days. You get paid and get fed! If you can help out please contact Jo Best on 07910 243788. If you won a Brian Winrow Trophy last season, please can you bring this with you to the first race meeting on the 13th April at Wooley Grange. If you unable to attend, please can you make sure that the trophy is sent back. If you need details of where to send it please message Dot on 07756 948960. As the racing season is fast approaching, we can confirm that the entries on the ACU website are now open for both Wooley Grange event and Preston Docks, with Dean Moor soon to follow. 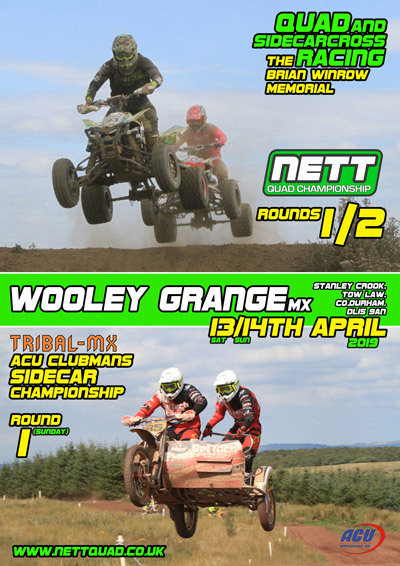 The permit number for Wooley Grange for both NETT members and also the Clubman Sidecars is ACU55809. Entries are open for this. Just for information, if you are a sidecar passenger who is entering on behalf of the team, remember to untick the rider button otherwise it shows as two riders. If you are wishing to be a NETT club member, it would a great help if you could do this online. You can still do this even if you are a member of another club and already have a licence. Just think, 5 minutes in the warmth of your own home filling in the details on a computer, compared to standing for possibly 15 minutes in the cold early morning before you can even think about racing. Its a no brainer to me! Let's start the new season all prepared and ready to race.